Chickens raised to produce the eggs that become “broiler” chickens are called broiler breeders. Male and female chicks are raised separately until they are about five months old. At that time, the young hens and roosters are brought together in laying houses that hold from 8,000 to 10,000 birds, with ten or twelve roosters for each one hundred hens. The flock is maintained for breeding purposes for about ten months. At a little over a year old, they are sent to slaughter. Their eggs are gathered and taken away to the mechanical hatcheries; the parents never see their chicks. Throughout the breeding period, roosters are rigorously culled (removed and killed) for infirmity and infertility and because “if a particular male becomes unable to mate, his matching females will not accept another male until he is removed” (Bell and Weaver, 641). Breeding flocks are kept on floor systems that are part litter (wood shavings) and part wooden or plastic slats. Each adult bird gets two square feet of living space (Bell and Weaver, 821). Breeder houses are equipped with mechanical nest boxes – one for every four hens – and feeders that are similar for the roosters and hens except that “the wires that allow the birds to slip their heads in to reach the feed are closer together on hen feeders than on rooster feeders” (“Growing Up with Tyson”). The reason for this difference is to keep the roosters from eating the hens’ food as they would otherwise do. 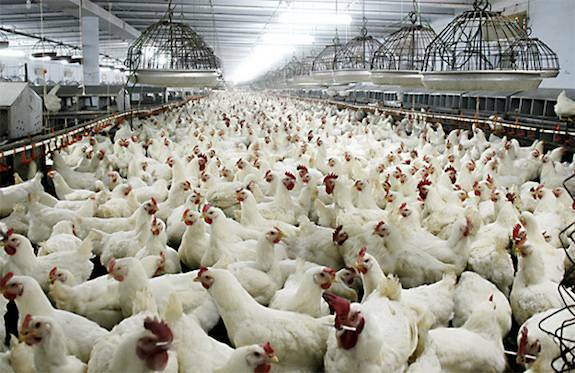 Breeding hens and roosters are kept on semi-starvation diets because the characteristics bred into broiler chickens to produce rapid and excessive weight gain in the chicks cause obesity, infertility and mating problems in their parents (Leeson, 49-50). Left to eat as they please, the roosters become so large, unwieldy and disabled that they cannot mate properly or even move without pain. Even as babies, their legs tremble when they try to stand up and walk a little, like the legs of very old men. To curb these effects, broiler breeder chickens are kept in semi-darkness in “blackout houses” that, added to the ammonia fumes, harm their eyes causing ophthalmic disorders. In addition, as already noted, they are kept on semi-starvation diets designed to control their weight and reduce their food intake (“Chicken-Rage”). Typically, a whole day’s food is withheld from the birds every other day starting at three weeks old or they are fed very small portions in “every-day feeding since it is more efficient” (Leeson, 49). The chickens rush pitifully to the feeders when the food is restored, often injuring their feet and other parts of their bodies in their desperation to eat. Bacteria invade the tissues and bloodstream following these injuries to the skin, particularly the feet, which become inflamed with a painful footpad disease called bumblefoot. ““Feed-restricted” chickens gorge themselves when the feeders are refilled, enlarging the capacity of their crop and gizzard to hold even more food, adding to the birds’ frustration. On days when food is withheld, they peck compulsively at spots on the floor, at the air, nonfood objects and each other’s heads, and, if permitted, they drink up to 25 percent more water than normal to compensate for the feeling of emptiness. Because this results in loose droppings and wet ammoniated litter, managers are urged to restrict the availability of water to “birds looking for feed” (Bell and Weaver, 631-633). 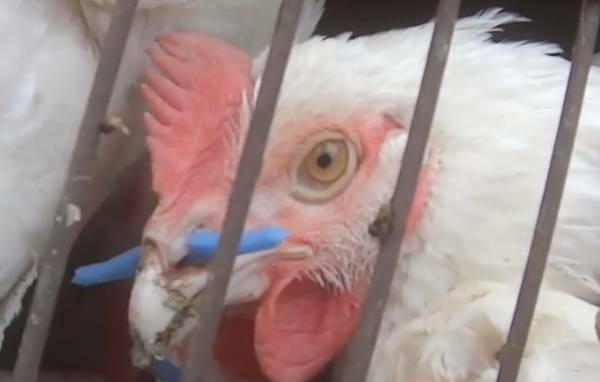 In addition to separate feeders for the roosters and hens, many broiler breeder roosters are implanted with a nasal devise called a “nozbonz” to prevent them from poking their heads through the hens’ food restriction grill. Maybe fifty percent of producers in North America use them, according to a University of Georgia researcher in 1999 (Mauldin). A new problem emerged in the poultry industry in the 1990s. An increasing number of reports described broiler breeder males being very aggressive toward females. This is highly unusual because male domestic fowl dominate females passively and seldom show any overt aggression toward them. – Ian Duncan, “Animal Welfare Issues in the Poultry Industry: Is There a Lesson to Be Learned?” 2001, 213. The “nozbonz” experiment was part of an investigation into the causes of unusual aggression in broiler breeder chickens, a new manmade pathology variously attributed to the birds’ impoverished environment, food frustration, and genetic malfunction (Duncan 1999). In one study, the introduction of “bales of plastic-wrapped wood shavings” to broiler breeder hens was said to “dramatically” reduce their unnaturally aggressive behavior (“chicken-rage”). 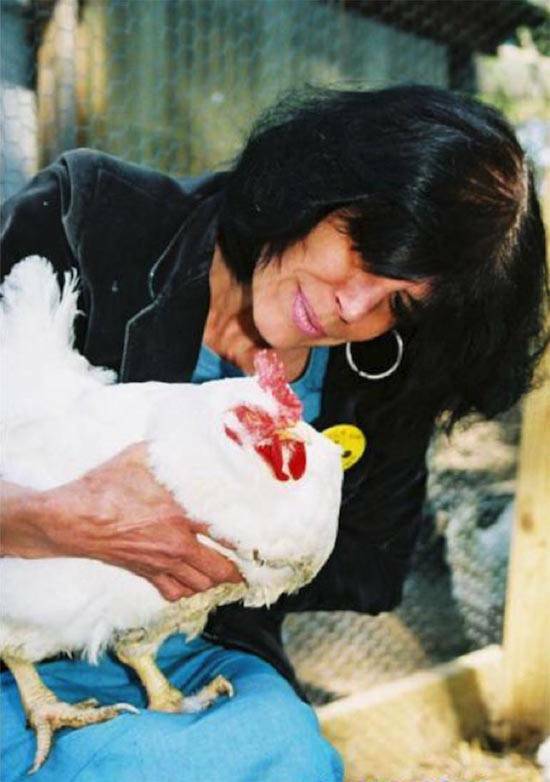 Studies by Millman and Duncan led them to speculate that attacks by broiler breeder roosters on hens is a genetically-based courtship disorder, since even roosters who have been bred for cockfighting “show little, if any, aggression toward females” (Duncan 2001, 213). The courtship theory recurs in Temple Grandin’s book Animals in Translation, which proposes that genetic manipulation of chickens for abnormally fast growth has somehow eliminated the rooster’s courtship dance around the hen that tells her to crouch into a sexually receptive position. When the hen fails to crouch or tries to escape from being mounted by the rooster, according to the theory (which Grandin mistakenly presents as a fact – “She doesn’t crouch down unless she sees the dance. – That’s the way her brain is wired”), the rooster attacks her with his spurs or toes and slashes her to death, an example of what Grandin calls “warped evolution” in animals bred for single traits at the expense of overall fitness (Grandin 2005, 69-72). Please watch Video of “spent broiler breeder” hens and roosters in 1995 truck accident. Bell, Donald D., and William D. Weaver, Jr., eds. 2002. Chicken Meat and Egg Production, 5th ed. Norwell, Mass: Kluwer Academic Publishers.